At a cost of £95 + VAT per user, the program is ideal for refreshers as well as new passports. 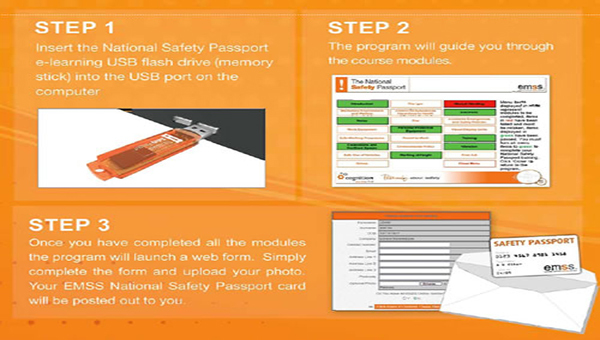 The cost includes the nationally recognised EMSS Safety Passport card which can be validated online for authenticity. DP Consultancy (NE) ltd offer a computer suite and the assistance of an experienced health and safety mentor to assist groups and individuals who may not be computer literate or may require further assistance to complete the safety passport. This service allows candidates to attend a safety workshop, complete the safety passport in 1 session, morning, afternoon or evening and leave in the knowledge that their competence can be authenticated by our company, the photograph is uploaded on their behalf and the card will be received within days. We have had positive feedback having delivered this service locally and to multinational / multicultural candidates. In the event of authentication being required at short notice to allow the candidate access to a client site, we can liaise with site directly on your behalf. SAFETY PASSPORT SUPERVISOR We are approved providers of Supervisor training for National Safety Passport which again can be delivered to individuals or groups at our venues or if facilities are available at your site. Our Instructors are experienced practical professionals, qualified to Diploma in Occupational Health & Safety Practice. This will exceed the employer’s mandatory requirements (HSE INDG381 COMPLIANT) to provide safety, health and environment (SHE) training at a fraction of the cost associated with more traditional passport schemes. The content of the USB flash drive (memory stick) has been Comodo, ‘Microsoft Authenticode’ signed as secure and free from viruses. The National Safety Passport e-learning program includes a comprehensive list of modules. These modules provide a candidate with the underpinning knowledge required to ensure safe working practices and fulfils the HSE’s mandatory requirements for all employers to provide basic health and safety training.